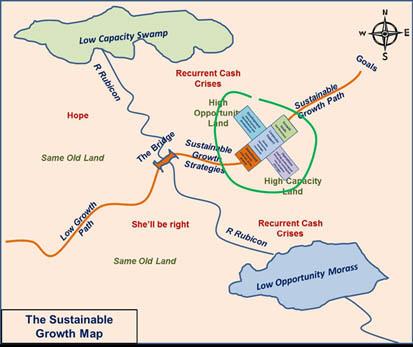 OK, you’re across the Bridge (see the Map) and heading along the Sustainable Growth Path. To a CEO, what should this feel like? And how do you avoid slipping off the Growth Path and wallowing in the Swamp or Morass? Investment – drives the company’s New Business forward. For Sustainable Growth this should be funded out of Cash flow. If you can’t invest, you’re unlikely to grow. The critical question is how much do you need to invest to meet your Goals? New Business – this is the future of the business and without which you can’t be sustainable. For many CEOs this is the most challenging because it involves getting a handle on the unknown. And involves behaviour and thought patterns different from rolling out product. The critical questions are – what works, and how much will it cost? Or how do you maximise your return on investment? 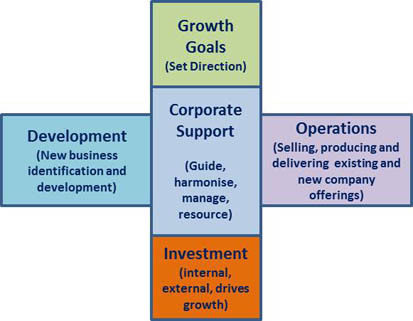 Corporate Support – as you can see this sits in the middle of everything. This is the cockpit and control panels for the company. CEOs should feel in control and able (with their Board’s guidance) to steer the company and to harmonise its activities – especially Operations and Development.